So here we are again. I had hoped never to need to write another post about cheating in a charity contest. When Vivint Gives Back started, several people asked me if I was going to be keeping an eye out for voting irregularities and compensated voting, given what’d happened during Chase Community Giving. I said I would, and if it happened, I’d write about it. Yesterday, Sabrina Melanie posted a link on my blog’s facebook page to a post at SwagBucks Offer Zone, in which iRazoo credts were being offered in exchange for Vivint Gives Back votes. That led me over to the Phoenix Rising forum, where payments being offered in online currencies were being discussed. The group offering the credits? A Chabad organization in Conejo, CA. The organization is Conejo Valley Friendship Circle, which, like Conejo Jewish Day School, is part of Chabad of the Conejo. Friendship Circle is a group that provides families that have special needs kids with support. Their main activity is supplying teenage mentors for those kids. The teenagers spend time with them, giving their families a bit of respite and providing the kids with friends outside their family. The Friendship Circle was founded in the Detroit area in 1994, and in West Bloomfield, Michigan, they have a special facility where the kids can come to practice life skills through roleplay. I absolutely love that – I wish I could visit and see it in action. The VoteFive.com page as it appeared during Chase Community Giving. Click to enlarge. Now, going back for a moment, for those of you who missed the Chase contest: Conejo Jewish Day School placed sixth in the 2011 Chase Community Giving contest. They won a total of $125,000. They were one of five schools – the VoteFive.com group – that ran up the leaderboard in the last few days. It’d been a pretty steady contest up to that point – not much change in where various charities were situated. Of the other four VoteFive.com schools, Silverstein Hebrew Academy placed 3rd, winning $325,000 (after winning $500,000 in Kohl’s Cares the previous fall), Southern Connecticut Hebrew Academy placed 7th, winning $125,000, Hillel Academy of Milwaukee placed 9th, also winning $125,000, and Lubavitch Cheder of Oak Park, MI came in 13th and received $65,000. 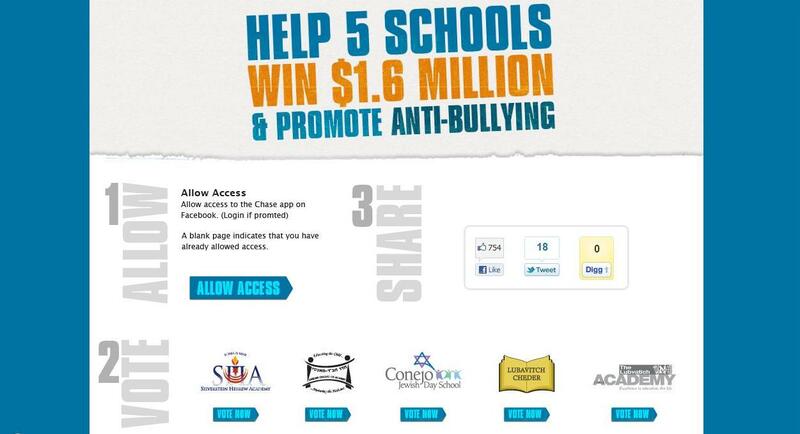 These schools offered game currencies and also direct payments in exchange for votes – up to $0.28 apiece. Silverstein Hebrew Academy paid the most and also placed the highest. So what’s going on in Vivint Gives Back? You can get 43 iRazoo points. This offer turned up two places: Project Swag and SwagBucks Offer Zone (click to enlarge). First, here’s the offer (click to enlarge). This is totally discouraging, right? Same basic thing as Chase, no recourse to do anything about it…or is there? 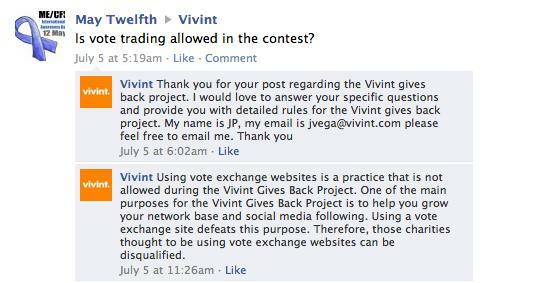 Early on in the Vivint contest, I asked if raffles and prize giveaways were permitted. Vivint said this: “Vivint does not condone or support the process of charities compensating voters for endorsing or voting for their charity. We feel that it is against the spirit of the competition and that the process should be avoided.” So they weren’t supported, implying that they were not disallowed, either. But they seem to have evolved their position since then. We are very sorry to have to report to you that Vivint has changed the contest rules and decided to *not* allow raffles or any type of exchange of goods for votes, including raffle tickets. They did this to even out the playing field a bit more and to encourage people to vote just because they believe in the causes. This is beyond our control and we have to abide by the rules. Kudos to them. I’m sure it was really disappointing to have to call that off. ME/CFS group May Twelfth (it’s ME/CFS awareness day, if you didn’t already know that) asked whether vote exchange is allowed in Vivint Gives Back. Vivint’s answer? This entry was posted in Contests and tagged Chase, cheating, contests, Swagbucks, Vivint, votes, voting, WPI. Bookmark the permalink. I’m quickly losing faith in all online charitable competitions. Vivint told me they are “watching these types of things very closely, and will take appropriate action”. i.e. They’re not in it for charity because what they really want is brand recognition hence an increase in their bottom line. Your conclusion, unfortunately, is precisely right. neither of the above comments is accurate or true. Brand recognition is a consequence of giving back to the community. However this was never Vivint’s goal. They are already a very very successful company, Vivint Gives Back is simply a good business practice. You should not take the above information seriously because clearly they did not do their research and the above information is taken out of context. Hi Ash. Thanks for coming by. You are entitled to your opinion, of course, as is everyone else here. However, I don’t permit duplicate comments, so I’ve removed your identical reply addressed to a different commenter. No, just an indignant person from Provo (where Vivint is based) commenting on an old post. communication with ME.CFS community and Vivint. Yes. 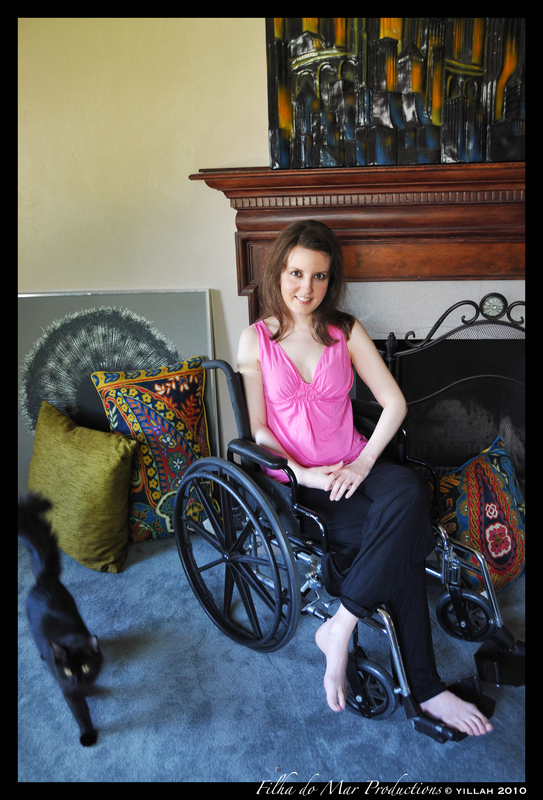 As I said to mecfs, above, precisely right. Thanks for your work looking into this. someone asked me to look into this since i am a (nonpracticing) lawyer. I would like to help but I haven’t been following the contest so i would need people like you to do the heavylifting (which you’ve done most of). I strongly suggest you contact Vivint and ask them to clamp down on Conejo for this cheating (you can use this word!). Also i suggest you contact the other top contenders in the region and ask them to contact Vivint. Plus contact Conejo themselves. Either you can draft text and i will edit it and send it to them under our join signature or you can send a note yourself and If they don’t respond quickly and satisfactorily, I can send them a letter. Please keep us on MECFSforums.com and PR up to date on this. You can contact me under my name at these forums. I know this is more work, but let’s see this thru and make sure WPI wins big! Justin, I sent all the info in this post (and more) to Vivint yesterday. Thanks for reminding me to contact the other charities – we did that during Chase, and it definitely helped spread awareness. I’ll likely post on their walls – that’s the easiest way to do so. WPI just posted the following. I have received notice of this website several times. I appreciate the diligence of everyone to keep this contest legitimate and full of integrity. I have contacted this organization to ask them to take this down. This post should be gone by the end of the day. It seems that it was posted by supporters of the organization and not the charity itself. I think we should definitely give Vivint a chance to deal with this . I think we should be thankful at a chance to win 100,000.00 and that they are taking this a lot more seriously than Chase Community Giving. What happened to WPI in Chase was not fair but now Vivint has a chance to correct that . Let’s give this new group a chance and keep helping the WPI do what it does best try to help others. Thank you for your help and support of WPI always. We are so thankful to everyone continuing to make a difference. You are awesome. And I have to say all of these charities are just as amazing as WPI it’s hard to know whom to support except for the fact of how very very sick us patients are. and that we continue to lose in federal and international acknowledgment and funding. Yep, I saw that Andrea had shared that as well as her response. Andrea and I have sort of been good cop/bad cop in both of these situations. Andrea keeps it strictly above board (and has more apparent faith in the powers that be) and I’m out here turning over rocks and rabble-rousing. There’s room for both of us. I’m starting to realize what is happening. I was told the links that I used and sent to you were disabled, and didn’t actually try again. When I go to razoo, the foodollars site, the 1 cash offer or the 5 cash offer, I am still able to vote. All the links work and it seems completely functional. The person who posted on the Vivint wall last night was voting on a link that is active for me still. He first liked Vivent more than 3 days ago when the offer was active. I believe that the people who have already allowed the app through the gwallet platform and have voted previously for incentives can still do it. The only difference seems to be that they are getting the confirmation but no money is being credited to them after they complete the vote. Someone posted on your wall asking where her gold was, and there are complaints on gwallet from people saying they completed offers and they do not see the payment in their account. I think the Friendship Circle has a very unique dilemma at this point because the offer still appears to be valid and they don’t seem to be able to stop the vote. Either they don’t keep their contract with the workers and deal with the resulting outcry or they pay their microworkers as promised and have to deal with the consequences of that. I am amused, and at present I am owed 5 cash and 43 razoos! Quite a dilemma indeed. It’s easier to just not pay – those rewards sites are known to be somewhat scammy and to not always work. You are so outstanding at this! With your knowledge I bet you could tell us how to win Chase next year, easily! I think we’re not eligible for Chase next year based on the amount we won this year. And I have to say, with as much dirty pool as there was during Chase, I don’t even want to get involved. Isn’t sad that that sort of means the vote-buyers won by playing dirty, in addition to winning money? I remember speaking with my husband about Chase and his feeling was it’s not really ‘their money.’ It is money they HAVE to give away. (I can’t remember if it was taxes, or some sort of charitable contribution thing)…but, bottom line, Chase never cared who got the money. The online voting contest was just extra publicity for them (two birds, one stone). Personally, I’m done with online voting. And, the same groups as repeat offenders… SKETCHY!!! Hope someone starts looking into it… if they’re not already. It’s definitely being looked into. What’ll happen, I don’t know. I hope the ill-gotten votes will simply be removed. I don’t know how sophisticated Vivint’s back-end for this contest is, but maybe they identify referrers? I really hope so. Have you ever heard of programs that mimic the voting trends of another charity so that they can make sure to get a certain percentage of votes above another? What I mean is, if you were to look at a graph of the vote trends of certain charities in the Vivint contest, would you expect the graphs for two of them to look the same? (ie. dips at the same time and spikes in votes at the same time). To me after seeing some graphs of the top two charities, they mimic each other almost exactly, to the point where in the matter of 4-5 days one of them literally doubled votes to an astronomical amount that they have NEVER reached before. I know there has been some talks about some charities voting for another because they know they won’t win and feel that the money that another charity could win could be a benefit to many charities so I would expect them to grab more votes from that other charity.. Maybe I’m just grasping at straws here but the graph just looks too suspicious..
Lily, I don’t find the moving up and down in synch to be suspicious. From the charts I’ve seen Jace make (here’s one that shows that synchronization) it looks like all of the charities move up and down relatively similarly. I think it reflects the availability of the voters and the voting mechanism – some days there’s trouble with the system, and there are fewer votes because of that. I know the two charities you’re talking about, and was aware last week of some of the deals being cut with people who didn’t stand to win switching their allegiances. I don’t know if it’s all on the up-and-up, but I know Vivint has been looking into it and has the information that I was supplied by a supporter of one of the charities. I had actually started writing an entry about it, and eventually the person who sent me the tip asked me not to publish the post because her charity was getting so much hate mail. I have been going through a really bad patch because of IRIS caused by GcMAF, so I was only happy to not have to expend energy that I really didn’t have. Vivint gives back to itself. Such a so righteous mormon mind set.